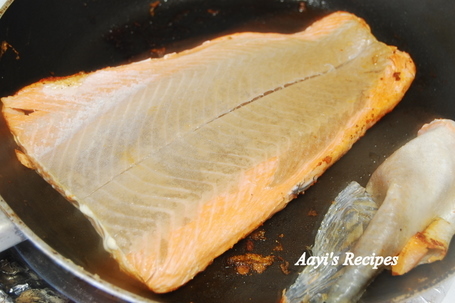 I am using salmon a lot these days, because of the high Omega-3 content in this fish. Usually I bake it or make some spicy dry dish, something we both really enjoy. 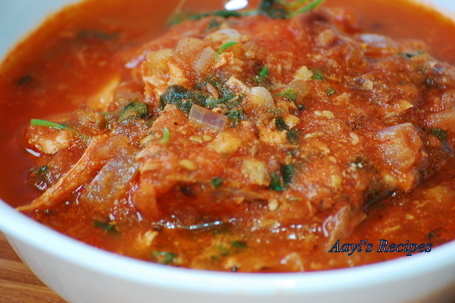 This time, I wanted to try it in this spicy gravy. This was inspired by a fish gravy I tasted at an Indian restaurant here 2 years ago. I have not seen this recently on their menu. 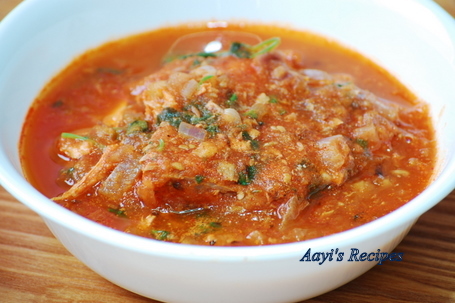 We had a very satisfying lunch with rice and this gravy. 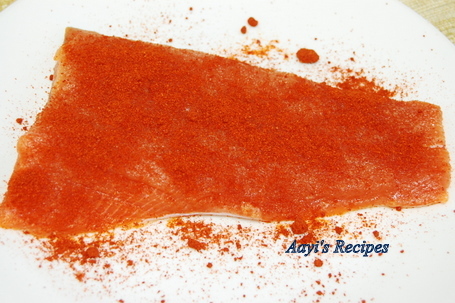 Spread salt and chilli powder on salmon. Heat tava and keep the spiced part down on tava. After 1-2min, turn upside down. Leave for 1 more minute. Turn again. Now slowly pull out the skin. Spread some more chilli powder and salt on this side. Let the fish get done from both sides. Take off heat and cut it into about 1X1 inch pieces. Heat oil. Add cumin seeds. Add onion, ginger and garlic. Fry till they turn brownish. 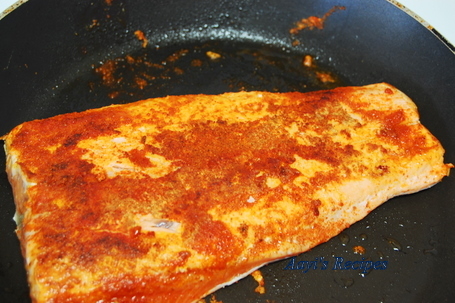 Add the tomato puree, spice powder and salt. Cook till the gravy thickens a bit. Slowly slide the fish pieces into gravy. Let it cook for about 1-2mins. Garnish with coriander leaves. Serve hot with rice. Great idea to remove the skin like that… first time I’ve seen that done! What a beautiful color, looks delicious. love Salmon. 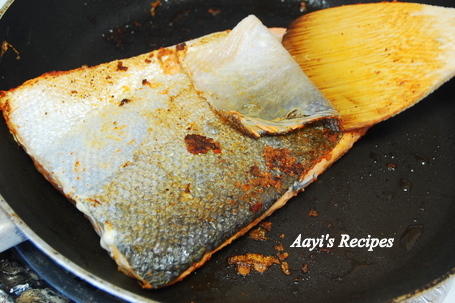 Hi Shilpa, I had heard that lot of the omega 3s are in the layer really close and just below the skin. So apparently it is better to not peel the skin. However I have never made salmon. And that skin does look thick and daunting. Have you ever tried not removing the skin? Does it become chewy? It looks very chewy and not appetizing for me. What I was told was, when you cook the fish with skin and then remove the skin like I have done here, the omega 3 is absorbed by the fish fillet due to heat. So, I don’t remove the skin before cooking. This was a suggestion I got at the fish counter here when I asked them to remove the skin. 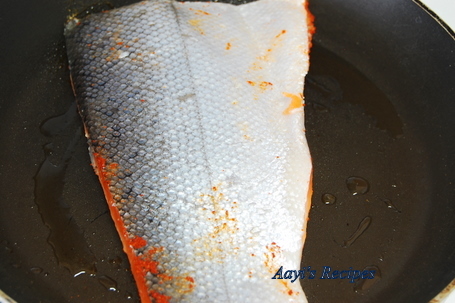 Also, I don’t think you can cut the fish into pieces along with skin after it is cooked, it may fall apart easily. That’s very informative. Thanks for your feedback. Its nice to get input without actually doing trial and error myself! 🙂 Happy cooking! this looks super delicious…nice color too !! It is so lovable & adorable….. The color is like magic….. It looks amazing and yummy Shilpa. Great work.. I tried this recipe twice, It came out so good my daughter could not stop licking her fingers :). I think this recipe can be tried with Surmai too.